Living in Florida, we are all more susceptible to the sun’s damaging rays, as our weather allows us to enjoy the outdoors all year round. Harmful UVB rays not only make us vulnerable to skin cancer, but they can cause severe premature aging. The sun’s photodamaging effects decrease our collagen level, which causes sagging, loss of laxity, wrinkles, and hyperpigmentation. Even though our bodies naturally produce collagen, once it starts to diminish due to damage or aging, it’s difficult to get it back into our skin efficiently. There are many topical collagen-boosting serums out there, but if the skin is unable to adequately “drink” it in, then the investment in those products is really not maximized. However, there is a way to apply high-grade collagen boosting serums that actually penetrate the surface of the skin and increase the skin,s elasticity, firmness, and youthful appearance rather quickly. The procedure is available at Aesthetic Treatment Centers (ATC) of Naples. 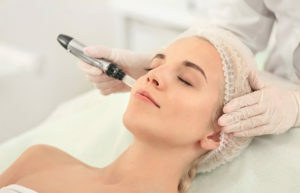 This powerful method is called, microneedling. Microneedling is a noninvasive, simple treatment option that is done in the convenience of our medspa. The small mechanical device is made up of superfine needles, which are strategically applied to the skin to gently perforate the outer layer. This technique on its own increases collagen, but when collagen-boosting serums are applied immediately after the needling, the infiltration and saturation of collagen is intensified. It’s also known as collagen induction, for the simple reason that it stimulates the collagen and elastin production in the skin. It works on the face and neck and other areas of the body, even improving the appearance of stretch marks. At ATC, we offer the ultimate skin rejuvenation techniques using your own PRP or growth factors. Blood is drawn and is spun down to extract platlet rich plasma, which is applied directly after the microneedling to supercharge your bodies ability to produce collagen and elastin. The skin will be susceptible to anything topical for up to 24 hours, so it’s essential to only products that our skin care professionals recommend and it’s also important to avoid direct sunlight for a few days. Your skin will start producing increased collagen 48 to 72 hours after the procedure and these results are long-lasting. Many people see skin benefits for over 8 to 10 months. edge products, you will always receive remarkable results within the serene, inviting atmosphere of the Aesthetic Treatment Centers. Headquartered in Naples, FL, Aesthetic Treatment Centers is located in the Advanced Medical Building at 720 Goodlette-Frank Road, Suite 300 Naples, Florida. To find out more about their procedures and expertise, please call 239-322-3790 for an appointment, or visit them online at atcnaples.com. Next BOTOX® for Overactive Bladder Frustrated with your Overactive Bladder (OAB) medication not working? Do the side effects pose more health risks than benefits?